So, that didn’t last long…we’ve merged weeks three and four owing to various trips abroad. We were pleased to attend the European Broadcasting Union Production Technology Seminar (EBU PTS) to hear about how broadcasters are looking forward to Ultra-HD and High Dynamic Range productions in the future, something we are also working on with a number of clients. Day three was also very interesting since it was about IP production. 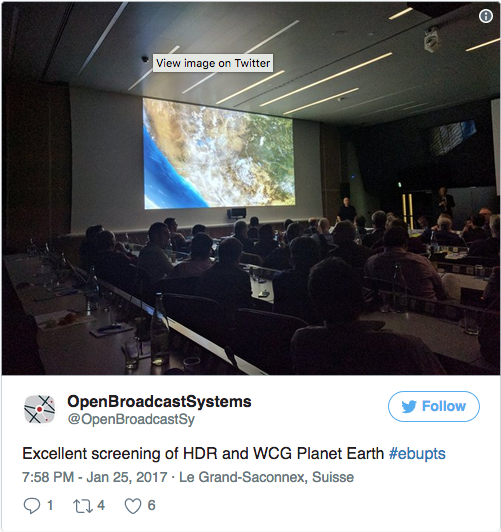 We had a standards update about SMPTE 2110 from Wim Vermost. His key point was it must be implementable in software, unlike the current proposals which are heavily skewed to hardware implementations. 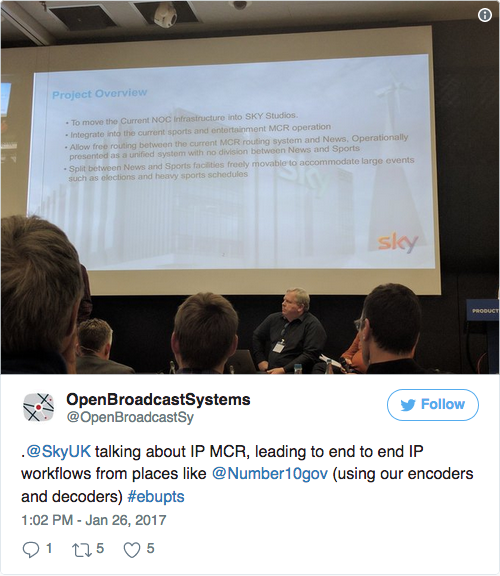 In a later session, we also heard from Sky UK about its plans to move its News and Sport MCRs to IP, in what appears to be the first public outing of this project. This ambitious project is something we have been working on with Sky for a while and our encoders/decoders form a significant proportion of the IP connected devices on the network. The presenter described a workflow we are closely involved in, a reporter speaks at Downing Street, that feed is encoded and transported over IP, it’s then decoded to SMPTE 2022-6 uncompressed IP at the studio and routed as pure-IP. Furthermore, this is a workflow that is entirely based on standard IT hardware, something industry “commentators” claim to be many years away. In an unrelated development Sky also announced that it was planning to deliver its channels over IP, a major move for a nearly 30-year old satellite platform. We’ve been working with IPTV pioneers such as Free in France for many years delivering major channels to millions over IP. The technical decisions that Sky take remain to be seen, whether they take a traditional managed IPTV approach or an OTT approach and how this affects the viewer’s experience. Interestingly, the move to IP means that a number of our team can become Sky subscribers for the first time since they aren’t able to have satellite dishes at home.